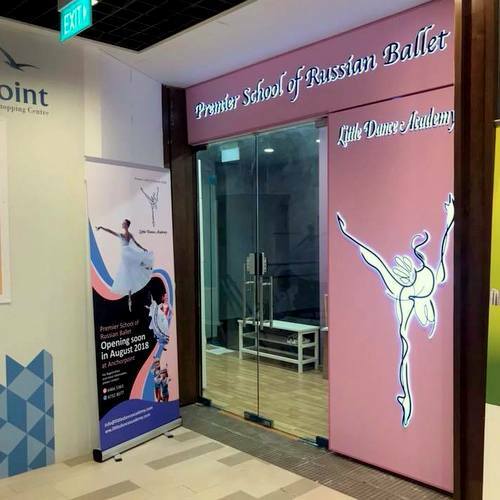 Premier School of Russian Ballet Little Dance Academy has two locations in Singapore, one at Anchorpoint shopping centre (370 Alexandra Rd) and another within Acacia Court (2 Pandan Valley). Founded by Belarusian ballet dancer Ms Elena Kanevskaia in 2012, Premier School of Russian Ballet Little Dance Academy teaches the Russian Vaganova ballet dance method. The Vaganova approach features a rigorous programme that has been designed to enhance strength and body expression, while emphasizing the importance of preventing injuries. All of the dance academy’s international teachers are professionally certified and experienced in their respective disciplines. Little Dance Academy’s classical ballet program offers bi-yearly internal evaluations during which they issue students with certificates indicating all the completed grades & stages of the curriculum. The dance school has classes suitable for various levels, such as point work, ballet repertoire, graceful body ballet, stretching classes, body conditioning, character dance, and jazz dance. Also, every year, the school produces a professional-level ballet performance, where students can take part in classical ballet productions staged by Ms Kanevskaia. In the past years, the school has put up, for example, The Nutcracker, Alice in Wonderland, Peter Pan at some of the biggest stages in Singapore. The official Little Dance Academy Facebook page is located at www.facebook.com/Rus.ballet/. You can also follow the official Little Dance Academy Instagram account, which in turn is available at www.instagram.com/littledanceacademy/.